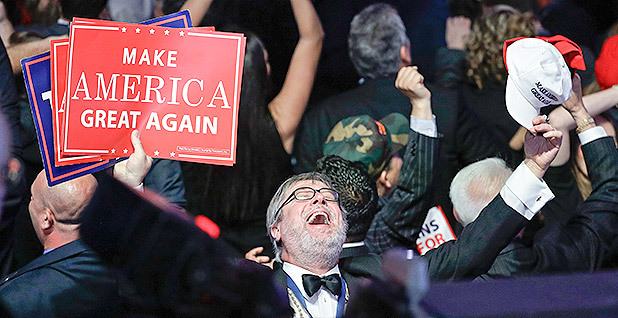 Donald Trump supporters react as they watch the election results during the Republican candidate’s election night rally. Photo courtesy of AP Images. The Obama administration's carbon rules for power plants are in dire straits after last night's election of Republican businessman Donald Trump as president. The Clean Power Plan is "in critical condition," said Michael Gerrard, faculty director of Columbia University's Sabin Center for Climate Change Law. But how, exactly, the Trump administration could go about eliminating the Clean Power Plan is still very much linked to litigation that is pending in federal court, legal experts said today. The president-elect would have various options based on how the U.S. Court of Appeals for the District of Columbia Circuit rules and how an appeal to the Supreme Court would take shape. "There are a lot of new unknowns in the mix," said Jack Lienke, an attorney at New York University's Institute for Policy Integrity. The Clean Power Plan, finalized in August 2015, requires states to develop strategies for reducing carbon dioxide emissions from existing power plants. Overall, the rule aims to slash power plants' CO2 emissions by 32 percent from 2005 levels by 2030. Dozens of entities, including 27 states, raised various challenges to the rule, including that U.S. EPA exceeded its Clean Air Act authority. Eighteen states and Washington, D.C., as well as cities, environmental groups and some industry groups, are defending EPA in the court battle. In September, a panel of 10 judges on the D.C. Circuit held nearly seven hours of oral arguments in the massive litigation. The court is expected to issue a ruling in early 2017, but it's unclear exactly when. Former Secretary of State Hillary Clinton, who had a lead in polls going into yesterday's election, had been expected to stay the course on the Clean Power Plan and continue defending the rule in court. But Trump has pledged to overturn the rule among a host of Obama administration regulations. "A key question is where the Trump administration will actually land on the issue of climate change," said Scott Fulton, president of the Environmental Law Institute and a former EPA general counsel. "We know what candidate Trump said about climate change en route to the nomination. He presented himself as a climate skeptic of sorts. But now we really do need to see where a President Trump would be on this issue." Still, Trump has "made it very clear he was not a fan of the Clean Power Plan," said Jim Rubin, an attorney at Dorsey & Whitney LLP and a former Justice Department official. "My expectation is that the administration will not actively support it. How it all works out will depend on what the court does." Ahead of the election results, Jeff Holmstead, a former top EPA air official and a partner at Bracewell LLP who represents industry clients, yesterday predicted that a Trump administration would move swiftly to reverse the rule. "One of the first things a Trump administration would do is submit a letter to the court saying that they plan to revoke the rule and asking for a voluntary remand," Holmstead said. "I don't know if they were to grant that — it depends on how close they are to reaching a decision." Thomas Lorenzen, an attorney at Crowell & Moring LLP who argued in September on behalf of industry foes of the Clean Power Plan, today said he expected the D.C. Circuit would still issue a decision. "Certainly there's the possibility that if they're still wrestling with the case come Jan. 20, you could see DOJ filing something that withdraws their advocacy for the rule," said Lorenzen, a former Department of Justice attorney. "But I don't think that will interfere with the D.C. Circuit's view that it has to rule on the lawfulness of the rule." It's "a little bit hard to anticipate" exactly what the court would do between now and Jan. 20, Fulton said. "It's also possible that the court, being observant itself of what's happening and how politically charged this rule is, could decide on its own to kind of slow-walk it until the new administration is in place," Fulton said. Legal experts today outlined possible scenarios for the litigation's fate if it continues to play out in the D.C. Circuit. If the D.C. Circuit strikes down the rule, it's likely the Trump administration will sit out an appeal to the Supreme Court, legal experts said. Other groups involved in the litigation may petition justices to take up the litigation, but the rule there may face an uphill battle in the form of a conservative-tilted court. The Trump administration "can wait for the D.C. Circuit to rule, and whoever loses will presumably appeal to the Supreme Court," Gerrard said. "By the time it gets there, there may be a new Trump-appointed justice, which would not bode well for a decision upholding the rule." On the other hand, if the D.C. Circuit upholds the rule, "we get a bit of a topsy-turvy world" in which the Justice Department could wind up asking the Supreme Court to vacate the rule, Lorenzen said. But the high court may be more receptive to arguments for vacating the rule made by other groups given that the Trump administration would have the power to undo the rule on its own, Lorenzen said. It's not unprecedented, though, for a new administration to argue against the positions the prior administration took. That scenario, for example, played out over EPA's authority to regulate greenhouse gases. During the Clinton administration, while it ultimately didn't issue regulations, EPA's general counsel said the Clean Air Act gave EPA the authority it needed. The George W. Bush administration disagreed. In a 2007 decision in Massachusetts v. EPA, the Supreme Court ultimately agreed with the position taken during the Clinton administration. In another example, when the Obama administration took office, it chose not to appeal the D.C. Circuit's ruling striking down the Bush administration's Clean Air Interstate Rule and Clean Air Mercury Rule. "There were a lot of folks who wanted the administration to defend both those rules, especially the CAIR rule," Holmstead said. "Had there been another Republican administration, certainly it would have appealed." It's possible that the same Justice Department attorneys who have defended the Clean Power Plan could find themselves arguing against it during a Trump administration, Lorenzen said. But environmental and public health organizations and EPA's state allies that have intervened in the case would likely still defend the rule, Lienke said. "Even if a Trump administration were to decide not to defend the rule in court, those groups are already parties in the case," he said. "They have standing to defend the rule." Enforcement of the rule, in the meantime, will remain on pause until the Supreme Court issues a final decision. Regardless, it's highly unlikely for President Obama's Supreme Court nominee, Merrick Garland, to play a role in the Clean Power Plan's legality, experts said. Garland, the D.C. Circuit's chief judge, recused himself from all litigation while his nomination was pending. If the courts were to uphold the Clean Power Plan, Trump's EPA would have to go through a formal rulemaking with public notice and comment to rescind the rule. "You have to look at the opinion that just came out of the D.C. Circuit. ... You have to explain the rationale for choosing to revoke the Clean Power Plan," Holmstead said. "It's possible the D.C. Circuit will say that the Clean Power Plan is based on a reasonable interpretation. It's not going to say that EPA was legally compelled to do it that way." A Trump administration would have to give a reasonable explanation for why it changed its mind, Gerrard said. "The court may or may not credit that change," he said. "Ordinarily, courts give a lot of deference to the expert judgment of expert agencies. But when the agency changes its mind for obviously political reasons, that reduces the deference." Another potential scenario: The Trump administration could take steps to revoke the Obama administration's rule for limiting carbon emissions from new power plants, a legal prerequisite for the Clean Power Plan. A swifter way to get rid of the Clean Power Plan could be through the Republican-controlled Congress, Lienke said. "If Congress were to block the Clean Power Plan, the litigation would become irrelevant," he said. On the other hand, the litigation and uncertainty could act as a "pressure point" for supporters of climate change action to mobilize around alternative means of lowering greenhouse gas emissions. "There has, within a number of industry quarters, been favorable discussions about a carbon tax as another alternative to the Clean Power Plan regulatory regime," Fulton said. Gerrard of the Sabin Center said he still expects the market to move away from coal even if the Clean Power Plan or some form of the rule doesn't survive. "One major part of the Clean Power Plan was accelerating the transition from coal to natural gas," Gerrard said. "Market forces are making that happen anyway, although not at the same pace that the Clean Power Plan would drive. "I think we are going to continue to see the retirement of old plants — just not as quickly." 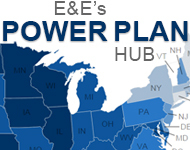 For more analysis, watch E&E News reporters' postmortem on what election 2016 means for energy and environment issues.